The Paleo diet is one that believes that humans "older" diet, the one of hunting and gathering, is the healthiest. This diet steers away from dairy products (such as milk and cheese), processed and packaged food, grains, and sugar; while replacing them with healthy meat, fruits, and vegetables. Helps Balance your Omega 3 and Omega 6 ration in your body. There is such a large amount of grains eaten by the standard American diet that most people have a high amount of Omega 6’s in their body relative to Omega 3’s. Why is this significant? Well, this causes an inflammatory cascade that can cause problems with arthritis, inflammation pain, heart disease, Alzheimer’s disease, diabetes, stroke, and many others. Eating fewer grains helps normalize this ratio and decrease inflammation. Sugar can be overt as in cookies or candy or sweets and these are not on the Paleolithic diet other than Paleolithic cookies which are also sweet to some degree. Having high amounts of sugar in the body due to your diet can cause extremely bad problems with diabetes, heart disease, weight gain, as well as thing that are less obvious such as sugar being a heavy inflammation promoter. Decrease or elimination of gluten from your body. Gluten is a protein found in grains that is very harmful to your body in many ways. It can cause problems with digestion, but it’s been found to cause many problems with brain health as well as being linked to thing such as brain fog, ADD, ADHD, and even schizophrenia. 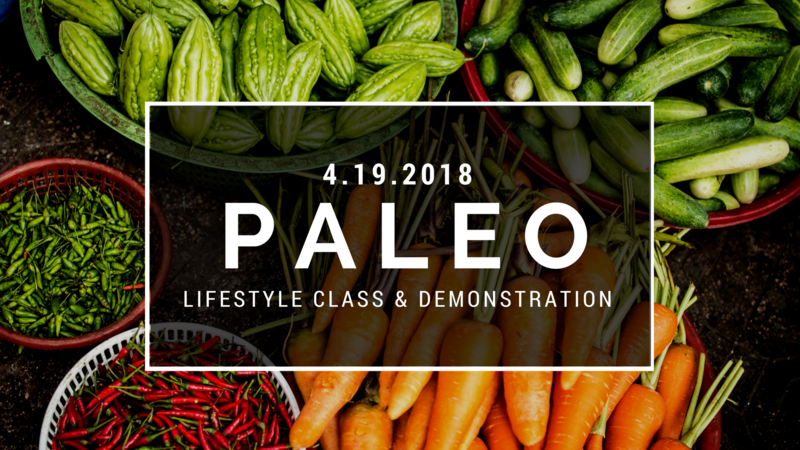 Join us April 19th from 6pm-7pm at Arkansas Physical Health & Rehab for our Paleo Lifestyle & Demonstration class where you can learn how you too, can start partaking in this healthy lifestyle. AFTA Certified, Stephna Masters will be teaching about this lifestyle and doing a tasty food demonstration. Why Should I come to a class? The answers are in the class. You may have someone in your family who is ill with disease, or have health problems due to bad diet choices, and you want to take action and prevent this from happening to you. Or one of the Doctors at APHR mentioned that a Paleolithic diet will decrease your inflammation that is causing your pain. Dr Masters will give you the scientific reasons why to start a Paleolithic lifestyle, and I will give you the how to start. Our focus for this class is to consider, “what makes this lifestyle challenging?” So Stephna asked her clients, her husband’s staff, and friends this question. Many said they would miss their favorite foods or treats. With their answers in mind, we will discuss how to have your favorites, but in a paleo manner: rice, spaghetti, wraps, chicken nuggets, dessert, and sauce. Of course, you will receive a copy of these recipes and a few more that we don’t have time to cover in this class. Stephna will also be available to make appointments to coach you on your journey to better health. Sign up today, call us at (479) 433-0800 or click here to sign up you and a friend!